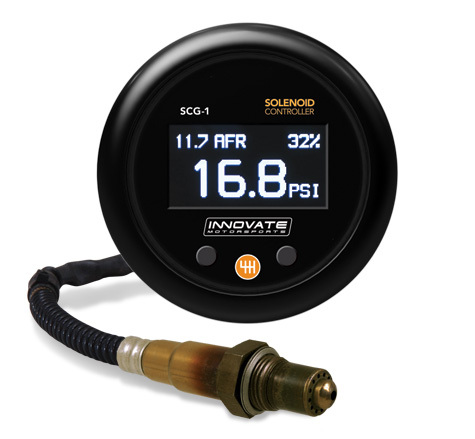 The Innovate Motorsports SCG-1 is a revolutionary approach to boost control that integrates an advanced standalone boost controller with Innovate’s industry leading DirectDigital™ wideband air fuel ratio technology. When we decided to build a boost controller, we knew we had to offer more capabilities than other products available today, while still maintaining the user friendly functionality demanded by our customers. Instead of repackaging the same boost control technology that has been used for decades, we choose to pair our advanced O² sensor control technology with our all-new, proprietary solenoid control that provides superior boost control accuracy, response and safety. We also added a user programmable shift light and housed the entire package in a compact gauge body for ease of installation and use. As with all of our air/fuel ratio products, the SCG-1 utilizes the only 100% digital wideband air/fuel ratio technology to provide real time feedback to the SCG-1. This air/fuel information is displayed on an integrated OLED display along with manifold pressure and wastegate duty status. The air/fuel ratio information is also used to provide a user definable boost cut that enhances the safety margin over most competitors offerings that only rely on over boost threshold. The SCG-1 has a full-programmable analog output ideal for applications using standalone ECU’s, piggy-back ECU’s or external data loggers. The SCG-1 also has a digital input/output for integration with our other Modular Tuning System (MTS) devices. This same digital output can be used to record air/fuel ratio, solenoid duty cycle, engine speed and manifold pressure with our free LogWorks PC software to help you dial in a perfect boost curve. • Patented DirectDigital™ wideband sensor control, the only 100% digital wideband air/fuel ratio technology! SCG-1 gauge, Wideband oxygen O² sensor, 8 ft sensor cable, O² sensor weld-on bung, 4 BAR Map sensor, Solenoid w/bracket, Vacuum hose kit, Black/Silver bezel, Black/White faceplate, Serial program cable, & Installation manual.